Pressure Cooker or Crock pot? Who has the best childhood education? As if looks were not enough of a distinguishing factor, I was also being raised very differently from the Chinese norm. From an early age (about 3), most kids in Hong Kong would start kindergarten and begin study in what was quickly becoming one of the most competitive educational systems in the world. Competition for jobs and higher education in Hong Kong was (and is) fierce and linked closely to educational rank so there was a huge emphasis on educating children as quickly as possible. This may have been the case in Hong Kong but my mother was of an altogether different, Swedish persuasion: kids should be kids and play outside for as long as possible. They had their whole lives to be formally educated. So while my Chinese friends were running through math drills I was tearing around the neighborhood in my classy red pedal car. I have come to look at this classic East/West division as the difference between the “pressure cooker” and the “crock pot” approach to childhood education. The Swedish model that I was subjected to was different and fell more in line with the overall Western style of education where you start educating kids a little later. Education then takes place at a more gradual (crock pot) pace. Western kids don’t catch up with their Asian contemporaries educationally until late high school / undergraduate studies. I was almost seven when I started first grade and until then I had only gone to kindergartens that basically focused on socializing kids rather than giving them an academic head start. I was happily surprised to meet some of my childhood friends from Hong Kong when I was in university in Michigan. A few of us ended up at the same school and by then it looked as though the educational gap had closed some (although I am sure they could still run circles around me in math and the sciences). The fact that each of us had chosen to come to the United States for college education, was, to me, significant. Previous PostThe Filipino Obsession with PAT BabiesNext PostShould you Spank your Kids? Hey…that was my 5th…or 6th birthday! 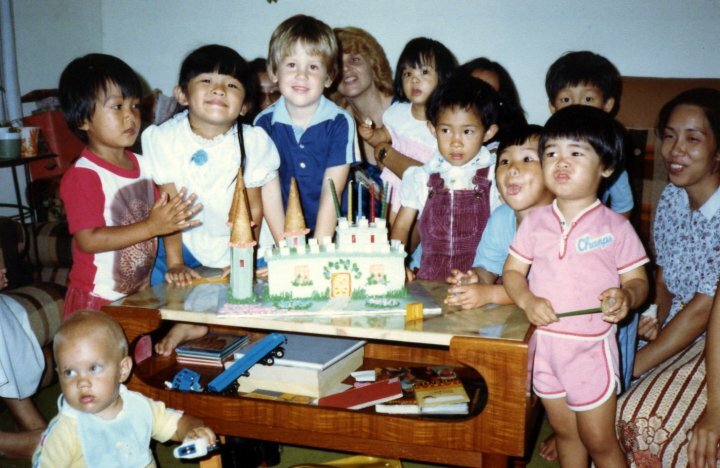 I was definitely ‘cooked’ in a crock pot…even though we were in Hong Kong, I only went to school when I was 8. I thoroughly enjoyed my childhood in Hong Kong! Really enjoyed reading your experiences with different school systems as I also got to sample a few in my lifetime. There are some who say that children are not really suited to learning in a classroom environment until they are about 7 years old…. I started in Yugoslavia at 6 1/2 and was the youngest in my class. By the time I finished 8th grade and moved to England at 14, I was helping A-level students do chemistry equations and such like for their homework, even though I was 2 years behind them in the English system. What I didn’t have was practical experience. Our teacher only demonstrated a handful of experiments at the front of the classroom, and even those went awry as the cheap old test tubes broke. So my first practical chemistry lesson in England I was petrified! I didn’t dare touch anything lest it dissolved my hand or something. I was also afraid it could all go “boom!” in a minute. But as far as the theory went, I was at least 2 years ahead, even though England starts school at 5 and Yugoslavia started school at 7. All of which worked nicely for me, because for the most part all I needed to concentrate on is translating my knowledge into English. No idea what you’re talking about but I’ll go with barbeque education – is there such a thing? Having grown up in Asia and here, I’ve experienced both kinds of education. Asian education is more rigorous no doubt and I felt like a better student. Western education allows you to be more creative and excel in the fields you really enjoy. I like the hybrid idea but not sure if I’d cook that way. I read a NY times article which talked about why Apple skipped out on having iphones/pads etc. manufactured here in the United States. One of the more salient points it made was that the overall cost of labor did not make up that big of a difference, but what did was the availability of qualified engineers. The US education system is just not producing enough for an economy so heavily focused on technology. Therefore, I think the real difference in our education systems isn’t so much early pressure v. later pressure, it is tailored v. one-size-fits-all. In HK, Taiwan, China, Japan, and Germany, students are put into programs that will focus their studies towards a certain career, in the US our focus is on providing students with a holistic experience that will let them find out who they are and what they want to do. While the later approach does sound sweet, I think it has been one of the biggest reasons why we have lost the race in tech industry. Sure, let kids be kids, but by the time they reach high school, it is no longer helpful for children not to have a goal. Students need a focus to help drive and motivate them. Perhaps if they knew what they were heading towards and were given experiences to make them more career focused, then it would help fix a lot of problems with both our education system and our economy.